What they got right: They tied most of the loose threads together, with the Coda arc of All Hail Megatron to do some of the rest. It was nice to see Jimmy one last time and Verity. Otherwise, not a whole lot to put here. I have to make a separate paragraph just to complain about the art, however. Once again, Nick Roche’s more cartoon style and James Raiz overdetailed style clash like peanut butter and WD-40. They just look so far different from each other as to drive you nuts, although I think the coloring may have saved it from going too far out of control compared to last issue. However, the reappearance of Verity and Jimmy after a very long absence from the IDW universe is another error, under Roche. He really should have looked back at the earlier appearance. Verity looks a bit too happy for Verity, her hairstyle is changed (I can understand not being able to get a decent haircut running around with the Autobots, but it still looks like she found a stylist), and although it’s been a while for me as well, I’m pretty sure Jimmy was dark-haired. I also wonder when they picked up t-shirts with the Autobot symbol on the sleeve. Recommendation: Serviceable, but hardly worth getting if you haven’t been getting the rest thus far. Now we just need to catch up with the rest of All Hail Megatron and we can move on to the Bayverse adaptations I haven’t covered, and I’ll need a new series for Thursdays. 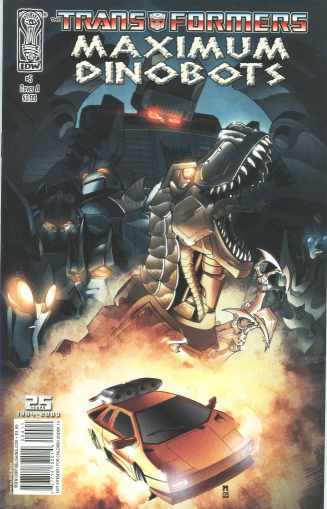 Posted by ShadowWing Tronix on July 12, 2018 in Yesterday's Comics and tagged Dinobots, Grimlock, IDW Publishing, Simon Furman, Transformers.